Bangladesh’s Chief of Army Staff Abu Belal Muhammad Shafiul Huq visited Beijing on Thursday. Bangladesh’s Chief of Army Staff Abu Belal Muhammad Shafiul Huq was in Beijing on Thursday, where he met with Chinese Defense Minister Chang Wanquan and Wang Jianping, deputy chief of general staff of the People’s Liberation Army. Both sides praised the development of China-Bangladesh military relations since the two countries established ties 40 years ago, and pledged deeper cooperation in the future. 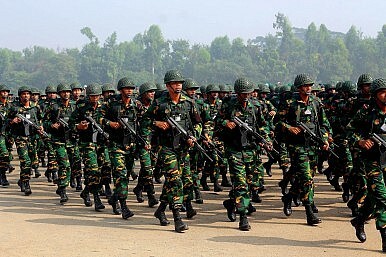 The two countries have built up a solid military relationship, thanks largely to the fact that China is Bangladesh’s largest supplier of military equipment. Since 2010, Beijing has supplied Dhaka with five maritime patrol vessels, two corvettes, 44 tanks, and 16 fighter jets, as well as surface-to-air and anti-ship missiles, according to the Stockholm International Peace Research Institute. That’s in addition to new Ming-class submarines Bangladesh ordered from China in 2013, which are expected to enter the Bangladeshi fleet in 2016, according to Prime Minister Sheikh Hasina. China and Bangladesh have been moving to expand their cooperation besides hardware exchanges. In particular, there’s a robust relationship for training and military exchanges. China’s PLA sends nearly as many delegations to Bangladesh each year as India does, Srikanth Kondapalli of Jawaharlal Nehru University told Reuters earlier this year. Last year, when a high-ranking Chinese military official visited Dhaka, the two sides signed agreements that would see China provide training for Bangladeshi military personnel. During Belal’s visit to China, Wang expressed his hope that “the two militaries can keep enhancing high-level exchange of visits, communication between military academies and cooperation in technologies and personnel training,” according to a paraphrasing by China Military Online. Belal, meanwhile, said that Bangladesh is interested in increasing its cooperation with China on personnel training and peacekeeping. Bangladesh and China are two of the world’s top contributors of troops to UN peacekeeping missions; Bangladesh ranks second, with China in sixth. Meanwhile, Bangladesh is also an important part of the “Belt and Road,” Beijing’s vision of an interconnected trading web stretching from China all the way to western Europe. Bangladesh features in the Belt and Road both as part of the overland component – via the Bangladesh-China-India-Myanmar corridor – and as a port hub for the Maritime Silk Road. The latter, in particular, has military overtones, as observers have often worried that China’s investments in maritime infrastructure are expected to bear fruit as military assets as well (the basis for the famous “string of pearls” theory). China played a large role in developing Bangladesh’s port at Chittagong even before the “Belt and Road” initiative came along — much to India’s dismay. Indeed, New Delhi has been generally wary of Bangladesh’s close military relationship with China, particularly the maritime component. Of particular concern is the plan for Bangladesh to buy two diesel-electric submarines from China, which will necessitate the construction of a submarine base in Bangladesh, a base that might play host to Chinese submarines in the future (as Sri Lanka’s Colombo port did last year). Bangladesh is aware of India’s worries and does not want to be caught in a tug-of-war between the two Asian giants. When Indian Prime Minister Narendra Modi visited Bangladesh last year, the two sides signed an agreement to let Indian cargo vessels use Chittagong port – a move read in India as reassurance that the port is not intended as a Chinese “pearl” in the Indian Ocean. In fact, Dhaka may have won tangible benefits from courting both China and India. In the past two years, Bangladesh has seen long-standing maritime and land border issues with India resolved in Dhaka’s favor, perhaps because New Delhi is eager to make sure its neighbor doesn’t tilt too far in China’s direction. India must make every effort to capitalize on her extant goodwill in Bangladesh before it's too late. China’s Vision for the Belt and Road in South AsiaCan China Solve the Rohingya Crisis?Submarines in the Bangladesh Navy: Acquired Deterrence or Strategic Misstep?India, Bangladesh Talk Coast Guard CooperationIndia Plucks a Pearl from China's 'String' in Bangladesh?